We all have nights when our brains are busy and we can’t find the “off” switch that will allow for a good night’s sleep. Ayurveda, yoga’s sister “science of life,” tells us that 10 p.m. is when pitta dosha comes to prominence for the second time each day and that after this point we may find it difficult to fall asleep until the wee hours. Unfortunately, there are many things that can shortchange our slumber. Parents and caregivers in particular often find themselves staying up late or being awakened in the middle of the night to meet their many responsibilities. Regardless of what keeps you up, or wakes you up, you’re likely to be cranky until you can lay your head down once again the following night. Although you probably cope with the exhaustion as best as you can, you may find your current methods are less than ideal. So, next time, before you call in sick and hit “snooze” or throw down a pot of strong java, you may want to reach into your yoga toolbox for the help you need to feel better in the moment, make it through your day feeling decent, and get back into your sleep groove. What kind of yoga is most likely to help you recover from sleep deprivation? While you may normally feel great after a vigorous practice, a short, grounding, stretchy sequence, like the one below, with a focus on expanding your breath, can make a real difference in your energy after a bad night’s sleep. Make sure you have a block handy. Start on your back with your arms and legs wide. Then, as you inhale, bring your right elbow down to the side and your right knee up to the side to touch (or almost touch) each other, while keeping your back on the floor. Exhale as you move back to center, then repeat on the left side. Alternating sides, do these movements a total of six times on each side. Then deepen the stretch on the lengthened side by reaching that arm and leg toward the bent side, coming into a kind of banana shape, for six more repetitions on each side. Then, letting your whole body follow the movement of your arms and legs, inhale into the banana side bend, and on your exhale, curl over onto your side in a fetal position for a few breaths; then roll back to the wide open center position on the inhalation and exhale fully. Do this six times total alternating sides. Roll over onto your belly and come up onto all fours. Place a block between your thighs, and lightly squeeze it. For three cycles, gently contract your glutes and tuck your tailbone just enough to feel a lift below your navel on the exhale; release the tilt with each inhale. 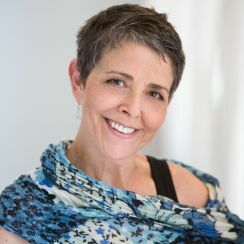 Then, for your next three breath cycles, focus on creating movement in your upper back while keeping the rest of your body still (this movement is like cat-cow, but you’re isolating your upper back): Round your upper back on the inhale and broaden through your chest on the exhale. This reversal of the usual breathing pattern for cat-cow can help engage a sleepy brain and help unravel any “knots” between the shoulders. 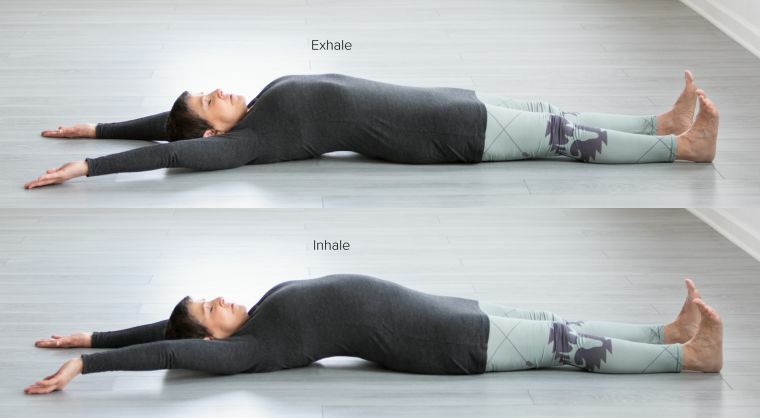 Then, for your final three breath cycles, put the whole movement together by rounding into cat on the exhale (as usual) and arching the entire back into cow on the inhale. Next, from all fours, bring your elbows to the floor for some upper-back strengthening and relief from neck stress. Start with a “no” movement of the head—exhaling as you turn to the left, inhaling to center, and exhaling right. Inhale back to the center and repeat the cycle two more times. Then nod your head “yes,” moving it down on an exhale and lifting it on an inhale, three times. Next try moving an ear to your shoulder on an exhale and inhaling as you return to center. Do this three times alternating sides. Now stand up, position your feet wider than hip-distance and slightly bend your knees for HA kriya. Inhale as you reach your arms straight out in front of you at shoulder height, palms facing up (which will help you avoid bunching your shoulders up to your ears). As you make fists and pull your elbows back, forcefully expel the breath from your lungs with a loud “Ha!” Inhale, reach your arms forward again and repeat seven more times (for a total of eight). Next, inhale to reach your arms overhead, and do eight downward fisted pulls with the vocalized “Ha!” exhale. Then do four more repetitions of each of the above, then two of each, and finally one of each. When you’ve finished, stand still for a moment and feel the energy and power you’ve summoned to bring into the day ahead. 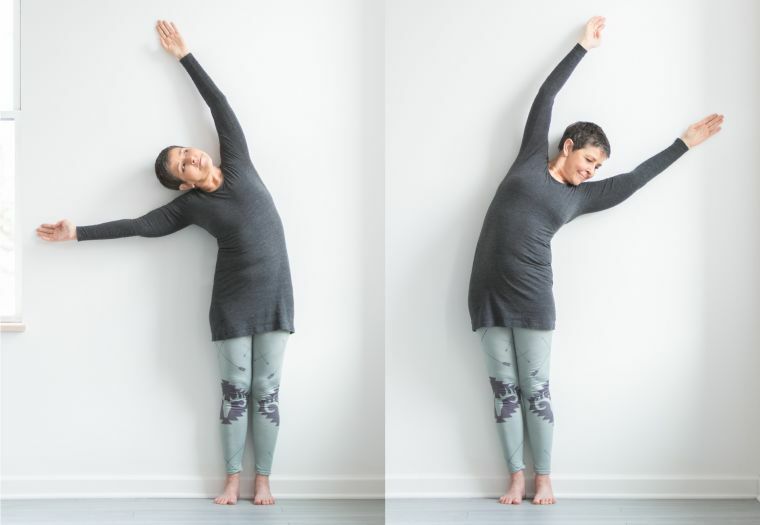 Stand with your back against a wall (to help you gauge your alignment), with your arms and legs spread into an X. Inhale as you reach out and up through your right arm and out through your left leg, coming to the toes of your left foot. Feel the expansion in the right side of your rib cage as you hold for three breaths. Then switch sides. Repeat twice more on each side. When you’re finished, come to child’s pose for 10 breaths. On each inhale, feel the expansion of the sides of your rib cage, waistline, and lower back. Roll onto your back and practice reclining agni sara (fire essence). In supported rest position (knees bent and hip-distance apart, feet flat on the floor), press your hands into the tops of your thighs near your hip creases as you inhale, and on the exhalation, contract your pelvic floor and then your lower abdomen. If you don’t have acid reflux, ulcer, or hiatal hernia issues and are not menstruating or pregnant, you can draw the contraction up higher into the abdomen as you continue the exhalation. As you inhale and relax your hands, release the contraction—first from the upper abdomen, then the lower abdomen, and then the pelvic floor. Try 10 rounds. Finish the sequence with tadaka mudra. Stretch out on the floor, with arms extended alongside your head and legs separated a comfortable width. Exhale deeply, lifting your pelvic floor and drawing your abdomen in and up; then inhale to “balloon” your belly. Repeat three times. Release into savasana, and focus on establishing an even, slow breath. Next, relax your entire body, starting at the crown of your head and working down to your feet. Then return your focus to the sensation of your breath in your nostrils and refine that awareness over the next five to ten minutes. Sit in meditation for five to thirty minutes before starting your day. In addition to yoga, there are some common sense suggestions for mitigating the effects of a bad night’s sleep. These include drinking extra water (as being dehydrated can make you feel more tired), and ending your morning shower with cold water (which can make you feel calm but awake). Also, eat foods that will sustain your energy throughout the day, get some fresh air and sunshine to reset your body's natural rhythms, and practice diaphragmatic breathing. First, in order to help reset your sleep cycle, try not to sleep late the following day. When evening comes, follow the ayurvedic recommendation to gear down for sleep an hour or two before bedtime (which includes avoiding screens during that time). To help you relax, try abhyanga (self-massage) with a quality oil, working from your extremities in toward your heart. Let the oil soak into your skin for 10 to 20 minutes before taking a warm shower or bath. Other helpful ideas include dabbing a bit of lavender oil on your pillow or temples, drinking warm chamomile tea or turmeric milk (this can be made with non-dairy milk if needed or preferred), gentle stretching, breathing in long, slow breaths, and meditation. Thanks to the above practices, I’ve had some surprisingly good sleep-deprived days. Those days, however, have also given me the opportunity to develop more compassion for people with chronic fatigue, as well as those who regularly have to stay up late (whether to care for sick family members, work the night shift, or for some other reason). You, too, can use your weary days to practice self-care even as you foster empathy for others. But get some good solid rest when you can!